The representation of the Mediterranean and the Atlantic coast more or less up to the latitude of London is quite perfect. It then becomes more rudimentary from this area to Denmark and is positively grotesque from there on. It is likewise possible to note the dearth of toponyms in the northern regions of the map. 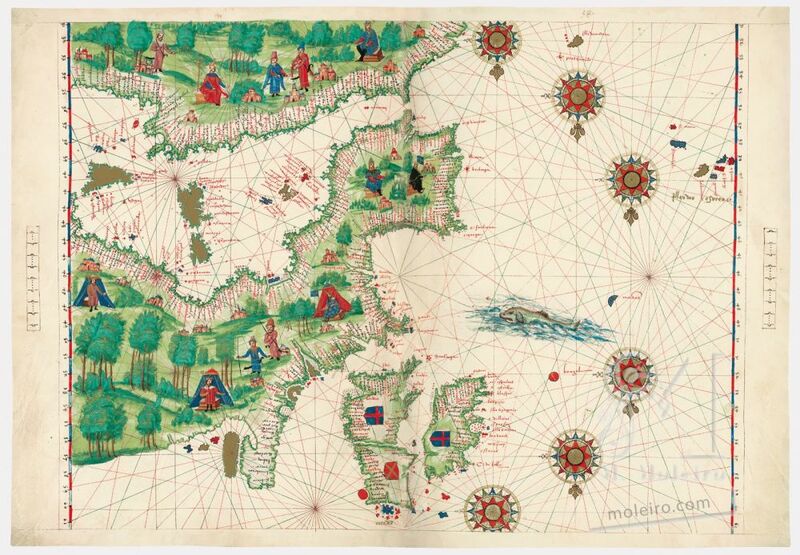 Apart from the numerous toponyms that have been left in Portuguese these cases clearly reveal that the map is a copy of a Portuguese nautical chart, since it is ignorant about what lay beyond the northern limits of habitual Portuguese sailing routes. The toponyms of the Mediterranean, as a general rule, derived from Italian, which demonstrates the tenacious persistence of Byzantine or Italian toponyms and reveals that they were substituted by Turkish toponyms only very slowly. This can be partially explained by the fact that the Portuguese had only limited contacts with the Ottomans. The geographical concept of Greenland as a part of Europe, which is reflected in this map, is not derived from that of the Cantino planisphere (which considered the possibility that Greenland was an eastern peninsula of Asia), nor that of the 1519 map by Jorge Reinel (which depicted it as an island between Iceland and Newfoundland, from which it is shown separated by a narrow strait), but is instead due to another notion that was widespread at the time and deemed it to be a peninsula at the extreme northwest tip of Europe. The most curious aspect is seeing the same concept of Greenland as a peninsula of Europe combined with a quite accurate drawing of its southern coasts. It only remains to add some minor comments regarding the map’s iconography. As in the other maps, the dearth of toponyms in the interior regions and the fact that rivers are reduced to their estuaries left ample space for illuminations. However, due to the extreme outlines of the European peninsulas, aggravated by the fact that the Black Sea has been shifted some 10° northwards, the area that was available for the illustrations is less than in Africa, in South America or even in Asia. On the other hand, the iconographic programme is less elaborate, containing virtually no allusions to fauna. The remaining illustrations are conventional images of fortified cities, which cover all the free spaces both in Europe as well as in the neighbouring areas of Asia and North Africa, and figures representing the main powers reigning in the different regions.